The weather is really weird these days because the year ends with high temperature. But for almost five years of living here in the metro, I've been hearing much about one of the most accessible get away places - Tagaytay. So one day, out of nowhere, we decided to experience what it can offer. 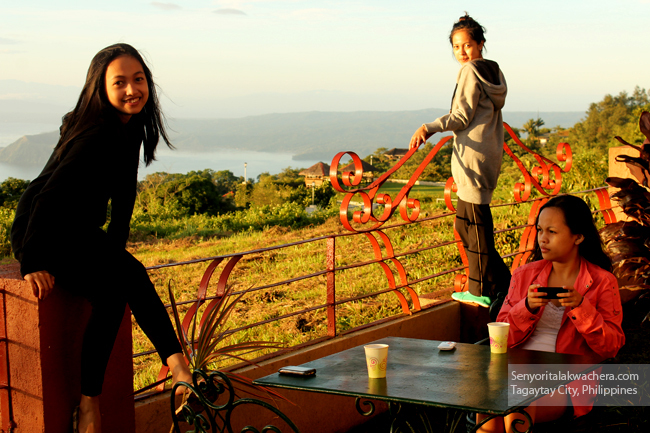 We don’t have much time to waste so we immediately took our way off to Tagaytay. It took us a 2-hour bus ride from EDSA and viola! There we are! We took another tricycle ride to Picnic Grove because I read that a lot of affordable accommodations are available around the park. We paid Php 11.00 per head from Rotonda - where the bus dropped us. Upon arrival we first went and checked for a place we can stay at – good thing I didn’t worry much searching for hotels online because there’s a lot of choices around the north ridge part of Tagaytay. We even checked the rooms first before deciding to stay. And finally we found Tagaytay Lake View hotel's place really comforting and affordable, so we chose to stay there overlooking the best views. After having a place to stay, we hit the road and started our tour on the famous Picnic Groove. A Php50.00 entrance fee is collected and we regret paying for it because we entered late and therefore we didn't enjoyed much than going there at day time. Anyhow, we just strolled around, watched the sunset and took some photos. Later we dined in at this restaurant in front of the park's gate which I forgot the name. Their food was okay, its pricy for the taste. I regret it a little when I learned that we could've taken a ride to south ridge where better choices of food houses are available. But it’s fine, that’s how a traveler learns anyway. After eating we went back to the hotel to get some rest. And woke up early to have some coffee and catch the sunrise. Everything was so majestic in the morning. I love the cold wind, the view, the color of the sky are so reviving; A very nice way to relax your exhausted thoughts. Early in the morning we went back to Picnic Groove and enjoyed horseback riding. They got a space for that and it was totally fun. We saw the zip line as well realizing it’s quite short and low so we passed on it. We drop by to check some souvenir before going to our next destination. After that, we headed our way to People’s Park, paid Php100.00 for the tricycle and Php20.00 entrance fee upon arrival. The gate is quite far from the peak so we need to walk (or should I say climbed a little). It’s quite tiring for a couch potato like us, but the view up there is stunning that it'll take all those tiring steps away and will only leave a beautiful panoramic scene of life around. "What a lovely place to be! ", I said, and started our walk down the gate. For a temperature and sight like that, getting hungry is expected. But its okay to feel hungry cause there are vendors in front of the gate, they sell some local delicacies and fresh veggies so you can grab some “kakanin” and continue the fun. hi i would like to know how much was your stay in the hotel? I forgot how much exactly but it doesn't matter, the hotel where we stayed already closed. how much for the entrance? ?